Are you at risk for oral cancer? Maybe not, but it can happen to anybody. Even if you are a dentist’s dream patient and follow the rules. Even if you have zero cavities. Even if your teeth are naturally straight and white. Let’s be realistic, here. The average Joe probably has no clue if he has oral cancer. However, the above average dentist can detect precancerous tissue in your mouth if they have invested in the sophisticated technology known as VELscope, an enhanced oral assessment system. Lucky for you, Dr. Jessica T. Emery is not your average dentist and only has the best tools at her Lakeview practice Sugar Fix Dental Loft. Dr. Emery has a powerful weapon at her disposal in the VELscope. Essentially a flashlight, the VELscope shines a fluorescent blue light into your mouth that is absolutely painless. When Dr. Emery looks through the VELscope, she sees your healthy cells reflected back into the eyepiece as fluorescent green. A darkened area reflected into the eyepiece represents unhealthy cells. This is due to the abnormal cells absorbing the blue fluorescent light differently than the normal cells. Isn’t science amazing? Who would have thought that oral cancer could be easily detected by shining a fancy dental flashlight into your mouth? Sounds too good to be true. Well, it’s real folks. Dr. Emery is a proud owner of this visualization tool and serves as her patients’ first line of defense in oral cancer prevention. If you have something in your mouth that is not supposed to be there – such as a lesion – listen up. Anything that has been in your mouth for more than two weeks that is not normally there needs to be looked at by a professional immediately. Obviously, having a device that can help discover pre-cancer and cancer is huge. Cancer kills. Who wouldn’t want a flashlight that detects cancer? Sign me up! The beauty of the VELscope is that it can also help Dr. Emery discover viral, fungal and bacterial infections; inflammation; salivary gland tumors; and allergies to fillings. 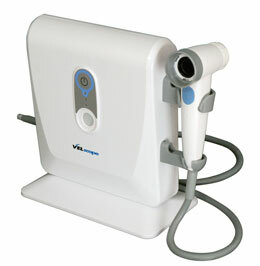 A VELscope examination can be performed at your biannual routine teeth cleanings. Along with the basic hygiene exam, you can ask Dr. Emery to take two extra minutes and find out if you have any symptoms or signs of cancer. Not bad for an extra 120 seconds at the dentist. We here at Sugar Fix Dental Loft promise it won’t be a waste of time. Don’t let oral cancer go undetected. There is no excuse why oral cancer should go unidentified with today’s technology. A few minutes and a couple of colors can be the difference between life and death. Don’t wait until a visible abnormality appears in your mouth. Just because you can’t see or feel it, doesn’t mean it’s not there. Make an appointment with Dr. Emery to have a cool blue light aimed at your gums, tongue and cheeks. It could save your life.